When it comes to financial centres in the Middle East, Qatar is very much the new kid on the block. Its rivals – Bahrain, Abu Dhabi and Dubai – are all better known and have more clearly defined identities as financial centres. Qatar is nevertheless determined to put its name on the financial services map in the Gulf region. Can it succeed? The diminutive Middle Eastern emirate certainly has the resources to throw behind its effort. The Qatari government has committed to investing over $140bn in the Qatar Financial Centre (QFC), which it established in 2005, and as a result has been able to attract established experts from the West to its regulatory authority, including Brian Quinn who has worked for the Bank of England, the IMF and the BIS, and Jean-François Lepetit, former CEO of Banque Indosuez and former president of the Commission des Opérations de Bourse, the French regulatory authority. 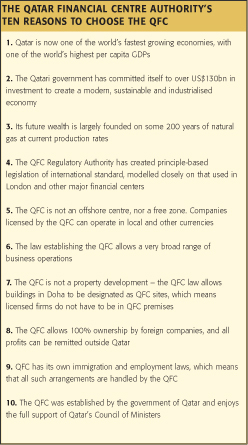 From the Qatari point of view, the rationale behind the QFC is obvious. Oil was discovered in Qatar in the 1940s, transforming it from a fishing and pearling community into one of the richest places on Earth. The emirate is sometimes referred to as the Saudi Arabia of natural gas because of its vast natural gas reserves. But big as they are, its gas reserves won’t last forever. Other infrastructure projects include a science and technology park, sports facilities, hospitals and educational developments. “Qatar wants to become a service centre for the region,” says Bell. The trouble with that, certainly on the financial services side, is that there already are quite a number of service centres in the region and they all have a longer history than Qatar. The brash newcomer is, of course, the Dubai International Financial Services Centre (DIFC), established in 2004 and strongly focused on foreign, mainly Western, business. Bahrain, meanwhile, has the history, having been the region’s financial centre since the 1970s when expertise moved there from the previous centre of Beirut, while Abu Dhabi is focused more on local business. Some doubt if there’s room for another centre. That’s by no means an impossible task, suggests Abu-Zaher; he points to the example of the US where Boston is the fund management centre, but stocks are traded on the New York Stock Exchange and the mercantile exchange is in Chicago. It is, however, an issue that Qatar needs to address. The example of the US exchanges is perhaps a good one, as Qatar is in the process of revamping its stock exchange with the help of Liffe-NYSE Euronext, which entered into a strategic partnership with the Doha Securities Market (DSM) in June. Under the terms of the deal, due to be finalised by the end of this year, the DSM is to be transformed from a domestic exchange into a regional exchange (to be renamed Qatar Securities Market or QSM) and a derivatives exchange, QDX, is to be launched. Liffe-NYSE Euronext will own 25% of the combined business and the state of Qatar the remaining 75%. While Liffe-NYSE Euronext does supply technology to other countries in the Gulf region and the Dubai International Financial Exchange (DIFX) is also planning to introduce derivatives trading, this deal is a little bit different and may help to give Qatar the edge it needs. and outsourced their asset management capabilities to them. Otherwise, suggests Abu-Zaher, it’s the usual suspects targetting HNWIs and family offices with wealth management solutions: Swiss banks, US players such as Morgan Stanley and Goldman Sachs, and Swiss private banks, such as Julius Baer. The number of targets in Qatar is quite small and so there’s little need for a substantial on-the-ground presence. At the same time, the local asset management industry is also small and heavily concentrated in the hands of the banks, and the stock market is shallow with only a 40 listing, mainly oil and gas-related stocks and shipping companies. However, more and more foreign asset managers are joining the QFC, according to Liffe-NYSE Euronext’s Jones, and the planned new QSM can surely only boost their numbers. The QSM will, says Jones, have a state-of-the-art equity trading system, connections to other players in the region, and be a leader in the Gulf region in the likes of equity derivatives futures and options, warrants and ETFs. As well as having a brand new stock exchange, Qatar has another advantage in this game: time. Dubai’s rapidly diminishing oil reserves mean it has had to diversify quickly; Qatar, by contrast, still has substantial oil and gas reserves and so can afford to develop in a more measured way. Some see this as a crucial difference that may play to Qatar’s advantage in the long run. The reality is it’s early days for Qatar and the QFC is perhaps still looking for its niche. A lot, suggests Bell, will depend on whether Qatar continues to open up and liberalise. One thing seems certain: there are too many centres in the Middle East at the moment trying to do the same thing. At some point all of them will probably have to define what their USP is. At the moment, it’s really a case of wait and see. Of the new centres, Dubai was first out the blocks and looks like the winner at the moment. The race is far from over, however, and in these testing economic times, Bell points to a key advantage Qatar has, which might prove crucial.